The great French superluxury cars of the 1930s were killed by the Great Depression and World War II, but what would a Delage, Delahaye, or Talbot-Lago look like if those companies had survived into the '80s? Maybe the 1988 Peugeot Oxia concept is close. Let me start with the stats, as just saying 'Peugeot concept car' doesn't exactly give you the right idea of how outstanding this car is. Two were built at a cost of 8 million Francs. 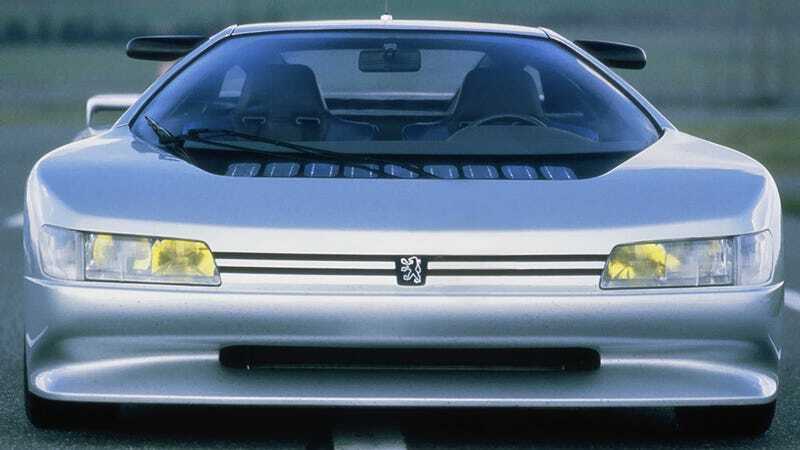 It's kind of hard to imagine now, but back in the late '80s, Peugeot was on a bit of a roll. Peugeot had just finished off its bonkers Group B program with the winning midengined 205 T16, they were dominating long-distance rally raids and Pikes Peak, and their engines were powering the fastest endurance racecars to ever lap Le Mans. I am of course talking about the 2.9 liter twin-turbo PRV V6 in the WM P88 Peugeot. That WM car managed a record-setting 407 km/h (252.9 mph) top speed on the Mulsanne Straight back in '88 with something around 900 horsepower. The Oxia had only 670 horsepower to work with, but its design team was run by the same Gerard Walter of the WM Le Mans project, as Autoconcept Review points out. That helps explain why the Oxia still managed 217 mph at the Nardo test track with Michelin test driver Jean-Philippe Vittecocq at the wheel, according to HowStuffWorks and this Flickr poster. Surprisingly, Peugeot themselves only expected 187 mph out of the car. And while it had a carbon fiber/kevlar body on an aluminum structure, and two limited-slip-differentials, and an adjustable spoiler, I love it for one statement issued by the man in charge of its interior design. That man was legendary car designer Paul Bracq, who was in charge of just about every classic Mercedes you can think of, among other things. Bracq gave this quote to Automobile Magazine, saying the car was "my idea of a Delage, Delahaye, or Talbot for the 1990s." And that sums the Oxia up perfectly — it had its design taken from the very fastest road racing cars of its day and done up in a luxurious, avant garde body. That follows the classic recipe of the prewar cars that Bracq mentioned. Back in the 1920s and 1930s, it was perfectly normal for a rich carbuyer to order a competitive grand prix racecar and have it rebodied for the street. Alfa Romeo was famous for it with cars like this 8C 2900B touring car, built off the same platform as this 8C 2900B Le Mans car. Delage, Delahaye, and Talbot-Lago did the same thing. So the Oxia isn't just yet another 1980s concept car, it's a reinterpretation of the golden age of the automobile. And that's why I like it so much.